After lengthy discussions with the University of Notre Dame's Art Museum, we were able to get an image of their painting by Francis J. Quirk. The painting was acquired by the Snite Museum in 1971 and was painted by Quirk in 1968. It is a monochromatic work entitled "Old Artist" and appears to be a self portrait. We would share the painting with you, however, the Museum has a strict policy against publishing images without permission from the artist or the artist's estate. Our best efforts to find a person who might hold the rights to Quirk's paintings have been futile. We know Quirk died in 1974. We don't know where. We have not been able to find a death certificate. We have not been able to find an obituary. We don't believe he had any children... The last census we found had him and his wife childless when he was 32. We attempted to convince the University that this blog should be allowed to publish the painting under the safe harbor of "Fair Use." "Fair Use" allows for the sharing of images for scholarly or criticism purposes. Here is the definition from Wikipedia. Fair use is a limitation and exception to the exclusive right granted by copyright law to the author of a creative work. In United States copyright law, fair use is a doctrine that permits limited use of copyrighted material without acquiring permission from the rights holders. Examples of fair use include commentary, search engines, criticism, parody, news reporting, research, teaching, library archiving and scholarship. While this blog is not Sister Wendy or the Arts Section of the New York Times, it does provide commentary, criticism, research and scholarship. The Canton Art Museum, The Georgia State Museum and Lehigh University's Art Department have all graciously made images of works available. 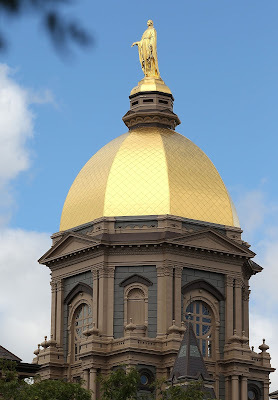 If you would like to see this painting while you are on the campus dominated by the Golden Dome, you can visit the Museum and ask to see it. Statue of Mary on the University of Notre Dame's Golden Dome. We do thank the staff of the Snite Museum for being open to our entreaties and sharing an image on a limited basis.